Meet Annabelle, she's a Sagittarius. Her theme is ripping sick shred sessions, or “surfing”, designed by Lara Papadakis. Annabelle is now cooling down scorching Phoenix, Arizona by putting icy cold Pacificos in the mouths of the party people. I'd be so psyched to see this thing drop off some yellow Pacifico boxes to the bars around town. I love it that a beer company is behind the making of actual, real art. This is so much better than billboards! 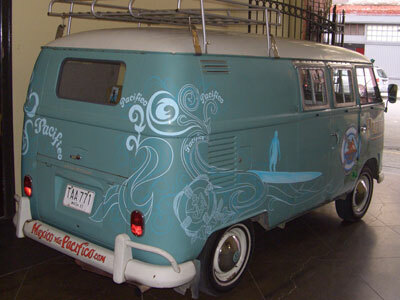 This was the very first bus painted for Pacifico Beer. It was painted by DC Signs & Graphics of Lake Tapps, WA.